Read on to find out what happened when the Swans played on October 21st in previous years. 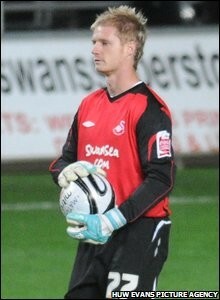 7 years ago on 21st October 2008 – With Dorus De Vries being stretchered off with a broken jaw after just 27 minutes, Swansea’s Mr Versatile, Alan Tate took over in goal as the Swans managed a 0-0 draw with Queens Park Rangers at the Liberty Stadium in the Coca-Cola Football League Championship. The 13,475 crowd watched on, as Tatey was rarely threatened in the Swans goal against a toothless and unimaginative QPR side. 12 years ago on 21st October 2003 – Tredegar born Mark Pritchard made his debut as the Swans lost 2 nil to Cambridge United at the Vetch Field. The crowd of 6,211 saw the team with the best away record in Nationwide Football League Division 3, take the lead after just 22 seconds! 15 years ago on 21st October 2000 – John Hollin’s Swans lost 1-0 to Wrexham, as Michael Howard was sent off for two bookable offences in this Nationwide Football League Division Two game at the Racecourse. 18 years ago on 21st October 1997 – Just 2,589 were at the Vetch Field to see the Swans slip to a 1 nil defeat to Mansfield Town in Nationwide Football League Division 3. 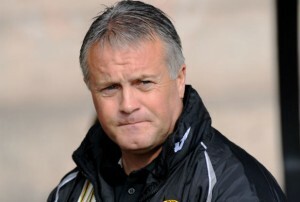 It was the 3rd defeat in as many games for Swans manager Micky Adams. Adams quit his job the following day, citing broken promises and alarming financial problems at the club as his reasons, after having been in the Swans hot seat for just 13 days! 20 years ago on 21st October 1995 – Carl Heggs grabbed a 2nd half equaliser as the Swans, under caretaker manager Bobby Smith, drew 1-1 with AFC Bournemouth at the Vetch in Endsleigh Insurance League Division Two in front of a crowd of just 1,988. 35 years ago on 21st October 1980 – An Alan Waddle brace helped the high-flying Swans secure a 2-2 draw at Luton Town in the Football League Second Division. 37 years ago on 21st October 1978 – Jeff Crudgington saved a penalty as the Swans came back from a two nil deficit early in the second half to clain a 2-2 draw at Hull City, thanks to goals from John Toshack and Alan Waddle in the Football League Third Division. The result ensured that Toshack’s Swans stayed third in the league table for the 4th consecutive week. 40 years ago on 21st October 1975 – Goals from Geoff Bray and Dave Bruton helped the Swans to a 2 nil win over Darlington in the Football League Fourth Division, in front of a 2,200 crowd at the Vetch Field. 43 years ago on 21st October 1972 – In his 1st week in charge, caretaker manager Roy Saunders watched his side grab a last minute 2-2 draw with Blackburn Rovers at the Vetch Field in the Football League Third Division. Goals from Brian Evans and Herbie Williams ensured that the 3,060 crowd went home happy.